Opis: On the Sun, S marks the spot. Solar explosions have been discovered to explode preferentially from regions marked with this letter. The surface of the quiet Sun is a maze of hot gas and flowing magnetic fields. When two regions of high magnetic field strength approach each other, they typically pass uneventfully. 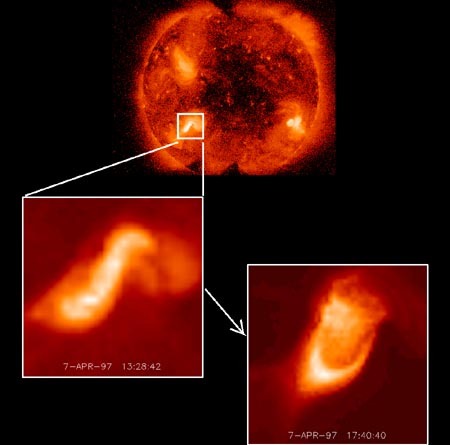 If the two regions pass close enough and in just the right way, however, an X-ray bright S-shaped region called a sigmoid forms and quickly explodes in a Coronal Mass Ejection (CME). Astronomers conjecture that in the center of the sigmoid, a circuit closes that somehow drives the explosion. The above picture shows the Sun in X-ray light. A pre-CME sigmoid is shown on the left inset image, while a post-CME arc is shown in the right inset.